The Choir on Hope Street gets a gorgeous new look! It is a truth universally acknowledged that there is nothing more joyously rewarding than singing in a choir. 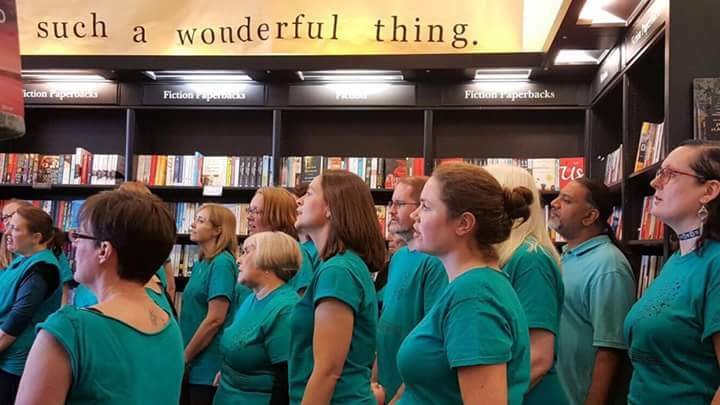 I have been the proud member of my beloved Churchfields Community Choir for nearly three years and can honestly say that singing with them has brought me levels of happiness that I hadn’t experienced since I wore out the cassette reel on my treasured Adam and the Ants Prince Charming album in the early eighties. When I wrote The Choir on Hope Street, I wanted to convey this happiness – this love for music and singing. I wanted to show the sheer joy you can feel as you channel your inner Carole King or Rihanna – as the real world melts away and for a blissful moment, hearts rule heads and music does its awesome thing. Of course it’s tricky to convey all this in a book cover but I am delighted to reveal today that those clever people at HQ have done just that with this brand new beauty of an eBook cover. So, stick on your favourite tune (I recommend Crazy in Love by Beyoncé for this particular moment) and feast your peepers on this! If you’ve already enjoyed The Choir on Hope Street, you’re also already one of my favourites. There are many wonderful things about being an author. Firstly, you get to write books and as we all know, everyone loves books. In the same way that everyone loves Cornwall and Mary Berry. It’s just a fact of life. If you ever meet someone who tells you that they don’t like books, take this as a distress call. They just haven’t met the right book yet. Simply lead them gently to the nearest friendly librarian or bookseller and they will do the rest. I love writing books – it’s the best kind of challenge. I love developing characters, weaving their stories, undertaking research (yes I really do need to watch that You Tube video of Bruno Mars again – my main character is a huge fan, honest) whilst doing my best to create something original and authentic, which readers will enjoy. I have even learnt to accept the bad writing days, when pulling just one word from your brain feels like delving into treacle, when you’re convinced that you’re rubbish at this and should be doing a proper job, like tidying the hell-hole of the cupboard under the stairs. I believe that this is part of the process (albeit a very tedious part). Any writer who claims not to have days like these is a big hairy liar. That’s another fact of life. You’re welcome. Last weekend I discovered the absolute cherry-on-the-cream-on-the-icing-on-the-cake (what? I like big cakes) moment of being an author. A book event. And not just any book event, my friends. Oh no. This was quite literally an all-singing, cake-eating book event. 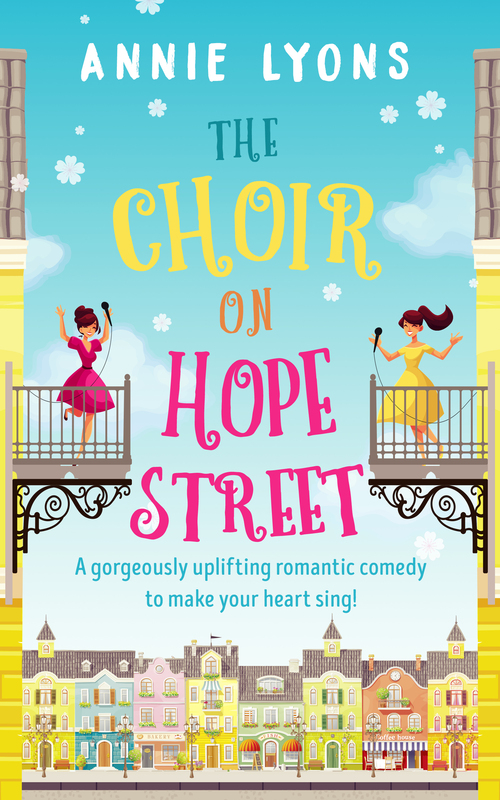 As many of you know, my most recent book is called The Choir on Hope Street. It tells the story of two very different women – Nat and Caroline, who come together to form a community choir when their beloved Hope Street hall is threatened with closure. 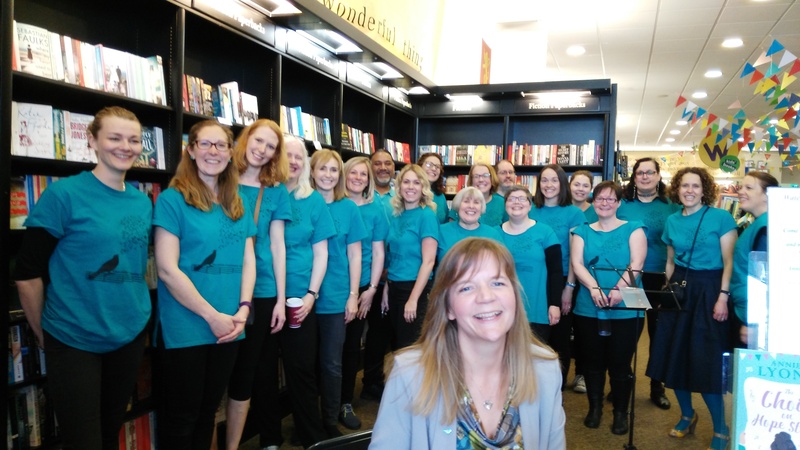 I have made no secret of the fact that I love my own community choir and they were a huge inspiration when I wrote the book. I wanted to write about how joyful I feel when I sing with them. If you’ve ever been part of a choir, you too will know how wonderful it is to share in that moment when the harmony sounds so sweet or indeed when you fluff it up and fall about laughing. Bloody marvellous, isn’t it? But I went. And I took my choir and I can honestly say it was the best day of my writing career so far. As we walked in and spotted my books on the table, a man approached me and offered his hand. I didn’t know him but he told me that he was a writer too. I’m not great at taking compliments so I smiled and muttered something self-deprecating but I was very touched. When the choir began to sing, it felt like the perfect summary of everything I was trying to get across in the book. I left my signing table and went to join them. I think this photograph sums up precisely how I felt. While I signed books for people during the break, I experienced a tiny glimpse into what it might be like to be famous in a low-key, writerly way. I can report that it is utterly lovely. Talking to all kinds of different people about books and singing? And there was cake too? What’s not to like? I was overwhelmed by the different people who turned up to support me – a school friend who I hadn’t seen for over twenty five years, two of my lovely author friends – one lady even asked me for a selfie. I was surrounded by my choir, my friends and my family – it was a bit like my wedding, just without the drunken dad-dancing. As the choir finished their last song, I wiped away a tear because I didn’t want it to end. I was having a moment – a very, very happy moment. 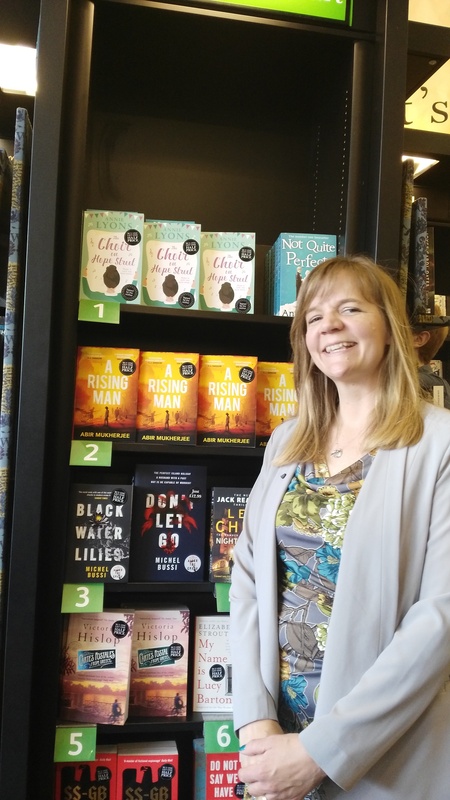 Needless to say, the bookshop were amazing and very pleased because I finished the event as their number one bestseller. 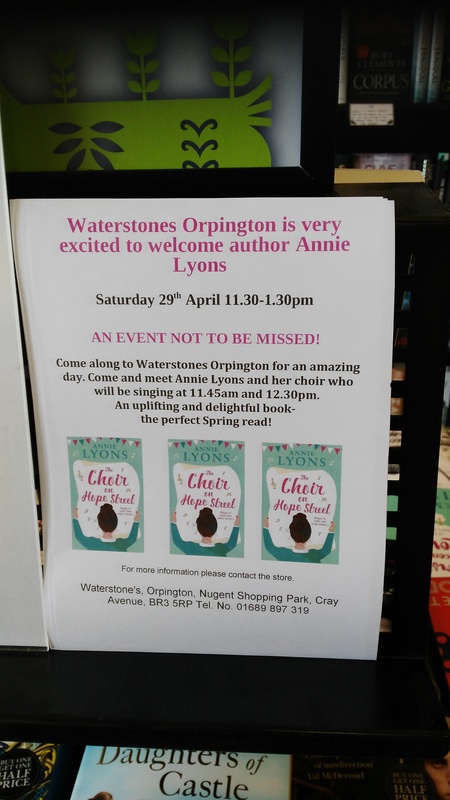 Move over, Lee Child – see what happens if you don’t make time for Orpington? For the rest of the day, I was buzzing as I shared pictures on social media and people responded with lovely comments. My favourite message was from a choir friend who told her six-year-old daughter about the event and my book. I’m already looking forward to her book-signing. My work is done and I couldn’t be happier. it’s been over a year since I’ve had a new book to share with you. So I am as excited as a Labrador who’s been left in the kitchen and just spotted a roast chicken on the counter, to tell you that The Choir on Hope Street will be published in paperback and as an eBook on the 6th of April! Firstly, I sing in a community choir and I love it. I am a passionate advocate of the power of music, singing and what it does for your soul. I believe that Ella Fitzgerald should be available on the NHS and they should begin an immediate cloning programme for Gareth Malone. In short, I think that singing in a choir is the most uplifting and wonderful legal high you’ll ever find. I shall be writing more posts about my choir when the book is published but needless to say, this awesome group was a great source of inspiration for me when I wrote the book. Secondly, a lot of people say that community spirit is dead, particularly in London. I disagree. This book is a love letter to the south-east London community that I have called home for many years and to all those quiet, remarkable people who pull together when they’re truly needed. Hope Street is their street and their story is about a community, which forms a choir to try to save their beloved local hall. Thirdly, this is a book about hope and my heart tells me (my brain agrees too – they try to avoid falling out if possible) that the world needs a little bit of hope at the moment. Nat’s husband has just said the six words no-one wants to hear – ‘I don’t love you any more’, while Caroline’s estranged mother has to move into her house turning her perfectly ordered world upside down. As they come together to form the choir to try and save Hope Street hall, they discover that you often find hope where you least expect it. So please take a moment to choose a fabulous song to play in your mind (for me it’s always ‘Feeling Good’ by Nina Simone) as I present the absolutely stunning cover and the link for pre-orders. I really hope that you enjoy reading this book as much as I enjoyed writing it for you, my bookish chums. May it make you laugh, cry and channel your inner Adele! O-oh. Rumbled. Authors are supposed to write about what they know and I clearly do not know what it’s like to have a sister. ‘I have a brother though,’ I plead feebly but as I consider my six-foot-two sibling with his size fourteen feet, I realise that this will not cut the mustard. My questioner fixes me with a suspicious frown. I’m for it now. I close my eyes ready to be lambasted. ‘You write as if you do have a sister,’ she says almost accusingly. I am relieved but it does make me wonder. Almost unwittingly, I have put sister relationships at the very centre of both my novels. Why would I do this? Why didn’t I write about a small girl with a brother, older by nine years who protected, annoyed and entertained her in equal measure during their late seventies-early eighties childhood (actually, hand me my notebook. I might use that one day). The four sisters that I created for my first two novels are all very different but they’re all the kind of women I would happily spend an evening in the pub with (my litmus test for any lasting friendship). The Darcy sisters from Not Quite Perfect would be a hoot. In fact, they do spend the evening in a version of my local pub with spectacularly messy results. There is a clear dynamic in Emma and Rachel’s relationship and this is never more apparent than during the scenes where their parents are present. It is a truth universally acknowledged that as soon as you are back with your family, often in the place where you grew up, you resort to type and not always in a good way. When they’re with their parents, Rachel and Emma forget that they are a mother of three and a successful editor respectively. They bicker, tease and ridicule one another like a couple of seven-year-olds. I can’t tell you how much fun it was to write. So it is with Bea and Lizzie Harris in my second novel, The Secrets Between Sisters. Bea has that similar vein of wit and character as Rachel but her straight-talking has a more defined purpose. Her sister, Lizzie has been estranged from her family and normal life for a long time. Bea is her only real friend and lifeline and when she dies, Lizzie is devastated and unsure how she will cope. Bea leaves her twelve letters to be read one a month over the following year. They contain her final wishes for her sister which she hopes will bring her lasting happiness. They also take Lizzie on a journey revealing long-concealed secrets that will change her life forever. These letters represent the ultimate gesture of sisterly love. They are Bea’s way of caring for Lizzie after her death and contain insights that only a sister would know. Bea understands Lizzie completely and also knows that her sister will do whatever she asks of her. She also knows that her words will be even more compelling once she is gone. Lizzie is not only forced to face her beloved sister’s death but also deal with the wishes and the conflicts they bring without Bea’s guidance. It is tough love delivered as only a sister can. I didn’t want the letters to be depressing though. As with Rachel and Emma, there is wit and warmth at the core of the sisters’ relationship. Although the loss of Bea is devastating, the humour contained in some of her letters and the way she recounts their memories and gently teases her sister, offer a nudging comfort and prevent Lizzie from getting stuck in a grief-flooded rut. So as you can see, sisters have proved a great source of inspiration to me and I hope I have done them justice. I loved writing these characters. I am fascinated by families and their messy, funny, infuriating dynamics and I think sisters encapsulate the very essence of these dynamics. No-one tells you the truth more candidly, more accurately and more bluntly than a sister but then no-one loves you more than a sister either. You can point out their faults but will not tolerate it if someone criticises them in return. It is a unique relationship and endlessly fascinating. As to whether I would like a sister? Possibly, but right now I’ll settle for my big brother and his size fourteen feet. At least I don’t have to worry about him borrowing my shoes. When was the last time you wrote a letter? I would like to say that I just have but I’m not sure if the hastily scribbled note enclosed alongside a claim for osteopath treatment actually counts. I’m talking about the kind of letter your parents or grandparents would have written long before the digital age engulfed us; words carefully constructed on sheets of Basildon Bond neatly held over a lined ‘underpage’ enabling you to write in a straight line. My mother still has a letter drawer in a dresser in the dining room. It contains old letters, writing paper, envelopes, a fat green address book with gold gilt writing nestled in its original cardboard box and a letter opener. My father uses the letter opener every day. It’s shaped like a dagger and my six-year-old son is fascinated by it. When he opens the drawer to retrieve it, there’s a smell of sweet wood mingled with the scent of treasured old letters; words of love, care and sadness from the past. It’s heady. This isn’t to say that I dislike other forms of communication. E-mails are fantastic but wildly overused. Social media is amazing but it has its time and place. Texting is brilliantly convenient but it’s not exactly the place for Shakespeare’s Sonnet 18. I’m not averse to a smiley face or a Megalol and I don’t think every communication should be a work of poetry either. The digital age has a lot to offer but my goodness it’s an exhausting place. I can’t help feeling that we need to take a break from the chit-chat world we live in and allow our brains to rest and settle a little. Typing at a computer or jabbing at your phone is a fundamentally different exercise to sitting at beautiful huge walnut writing desk overlooking a delightfully blooming garden as you lay down your worldly thoughts for another person. What? I dream for a living, okay? Kitchen tables are also fine. I think it’s partly the physical act of letter-writing that makes it so special. Consider for a moment; here I sit, typing my ideas for you to read and every word is delivered by me effectively stabbing at the keyboard, punching out my thoughts. This works beautifully when you need to get your words down quickly. Plus I can delete, re-jig and re-form with ease, which is a blessing. You wouldn’t want to read my first drafts. Not even I want to read my first drafts. Writing on the computer is contained and focussed; it’s efficient, enabling me to box my ideas and assemble them into some sort of order. Putting pen to paper is entirely different. As a writer, there are times when I need to let my brain spill over like an over-risen soufflé. I want to set it free from contained thought and explore its deepest recesses. That’s when I retrieve my latest notebook and my favourite pen. I often go and sit in a coffee shop to remind myself what real people look like. I watch and listen and sometimes write nothing at all. But often I will find myself noticing a couple of people and I will try to invent a story about them. And when I put pen to paper, the sheer act of writing on a page allows my brain to open up in a way that my keyboard often does not. It’s the same process with letter-writing. The conscious act of opening a pad of note-paper, writing the date and address, and beginning, ‘Dear,’ is very intimate. It takes care and attention because you are writing to one person. Every word counts. You need to linger as you write. There is little room for deleting or editing. You are holding a one-way conversation with the recipient but because it is one-way, you will can share your innermost thoughts without fear of contradiction or interruption. In turn, to receive a hand-written letter is uniquely special. These days, the letters I receive are usually from older friends or relatives and the letter is often a card but still, the physical act of opening and reading a note from someone who has taken the time to write to you is a treasured moment. Sometimes, the letters will make you laugh, other times they will make you cry but they will always make you stop for a moment longer than usual and think about the writer and what they mean to you. When I was a student, I lived in Munich for a year. For the first few months I was desperately homesick, living in another family’s house, trying to come to terms with the language and culture. One of my university friends used to write to me. She would recount tales of the house she was now sharing with fellow-students; of their various exploits and catastrophes. These were delivered with such humour that if I received one in the morning, I would save it for the evening when I could lie on my bed propped up by the flattest pillow known to man and laugh until the tears rolled down my cheeks and my stomach ached. For me they were a godsend and even twenty years on, I can remember the comfort I felt at the sight of her hand-writing. Someone was thinking about me and cared enough to let me know. This is an inferior example when you compare it to the impact letters have had during wars over the centuries. The letters sent between soldiers at the front and people back home during the two World Wars were quite literally matters of life and death. When you read the well-documented array of letters between sweethearts, from mothers to sons, from fathers to their children, you understand what it is to be human. The mundane details of people’s lives are there offering a distraction to the sheer awfulness of the situation, but most of the letters begin and end with love. They are declarations of the heart, pure and true because when you are facing the very real possibility of death, what else remains but love? Letter-writing has always been inextricably linked to love. True, there are such things as poison-pen letters but these days the internet seems to be the place where people choose to spew their hate-filled bile. Maybe this means that the hand-written letter can be reserved for love and care. I hope so. When my father in law died, his wife received over a hundred letters and cards; handwritten notes filled with kindness and love. Not e-mails or texts but words on a page doing their best to convey sympathy and offer comfort. She reads them from time to time even now because they remind her of the person she loves and misses still. When I was a child, my mother encouraged me to write thank you letters after every birthday and Christmas. I didn’t need much encouragement. I loved using my Paddington Bear stationery set (who wouldn’t?) and I followed her guidance carefully. Address on the right, date on the left. Dear whoever, thank you very much for the (detail gift here). Now write a sentence about why you like the gift and tell the recipient about what you did to celebrate. Finally, thank them again and wish them well. I still write letters of thanks and encourage my children to do the same. It feels like an important ritual; part of my family heritage and something that is worth preserving. Writers love letters almost as much as they love books. They are laced with possibility. They can hide secrets or reveal truths, they can upset, thrill and gladden. They are a window to the soul. 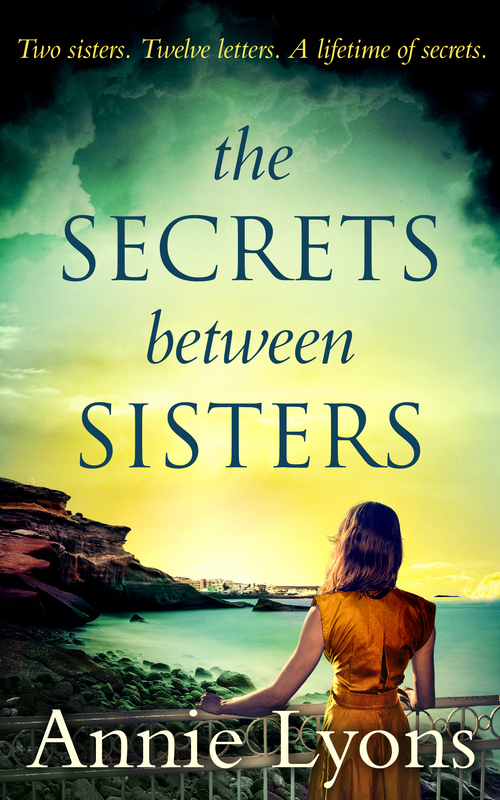 Letters were uppermost in my mind when I came up with the idea for The Secrets Between Sisters. I wanted to write about two very different but completely devoted sisters. Bea Harris is the strong one, the one who always knows what to do. Her sister, Lizzie is the polar opposite, estranged from her family, lonely and alone. Bea has been her only support through life and when she dies, Lizzie wonders how she will cope. Her sister leaves her a package of letters containing her final wishes; wishes that she hopes will help Lizzie find happiness but wishes that will also reveal some difficult truths. When Lizzie reads Bea’s letters month by month, she discovers comfort in her sister’s written words. The sight of her handwriting and the fact that she is holding a letter that her sister once held makes her feel as if Bea is still with her in a way, guiding and counselling her through life. They also take her on a journey, revealing secrets and truths, which will change her life forever. Of course, you don’t have to be life-changing when you write a letter. It can just remind people that you love them or are thinking about them. In the ubiquitous world of e-mail, it is special and rare; a treasure to be preserved. I hope we can hold on to the art of letter writing. In this busy, immediate world they offer respite. They enable us to pause, reflect and record important things that need to be said; thoughts and fears and hopes. They offer comfort and love and show us the essence of the person who wrote them. So I am proposing a mini-revolution right now. Why don’t you dig out that old note-pad or treat yourself to a new one and put pen to paper? Let’s all write a letter to someone we love. Let’s take a moment to reflect about them and what they mean to us and let’s tell them. Let’s take a break from the chaos and feed the soul. Who knows where that revolution might take us? I love the sense of possibility that leaps into my brain at the word. For some reason, I immediately conjure up the Disney fairy-godmother and the sweeping ease with which she transforms Cinderella. One of the best things about makeovers is the way that you can apply them to so many areas of your life. Realise you’ve had that Rachel hair-cut for one decade too many? Time for a Kate Middleton makeover! Decided that the block-colour pairing of midnight blue and lime green in your son’s bedroom is hurting your eyes? Fetch me the Dulux paint chart – we’re doing the DIY makeover challenge! And so it is with books. Every few years, they become out-dated. They start to look as tired as a toddler after a day at the funfair. They need a re-think. They need the book equivalent of a spa day. I am therefore absolutely delighted to announce that ‘Dear Lizzie’ is having just such a makeover. This was my second book following hot on the heels of ‘Not Quite Perfect’. It tells the story of Lizzie, whose beloved sister Bea dies leaving her twelve letters to be read one a month over the course of the following year. Bea’s dying wish is that these letters will bring her sister the happiness she lacks. However, they also unlock the secrets that have remained hidden for so long within the sisters’ family and it is these secrets that will change Lizzie’s world forever. In light of these themes and the darker, more intriguing side to Lizzie and Bea’s story, those clever, clever HQ editors and designers have transformed both title and cover and given the book the most stunning makeover. And I am slightly over-excited to be able to show you the new look below. If you’ve already read this book, thank you – you are one of my favourite people. If you are intrigued by Lizzie and Bea’s story and would like to read it, you can click to buy here.